The current monthly report on Greater Vancouver real estate shows the benchmark price for detached homes in the west of the City of Vancouver crossing the $3,000,000 threshold. This is in an urban region where Statistics Canada reported the median household income as $73,390 in 2013. Until recently, governments downplayed the significance of runaway home prices. The problem appeared to be mostly confined to detached homes in a few upscale enclaves. 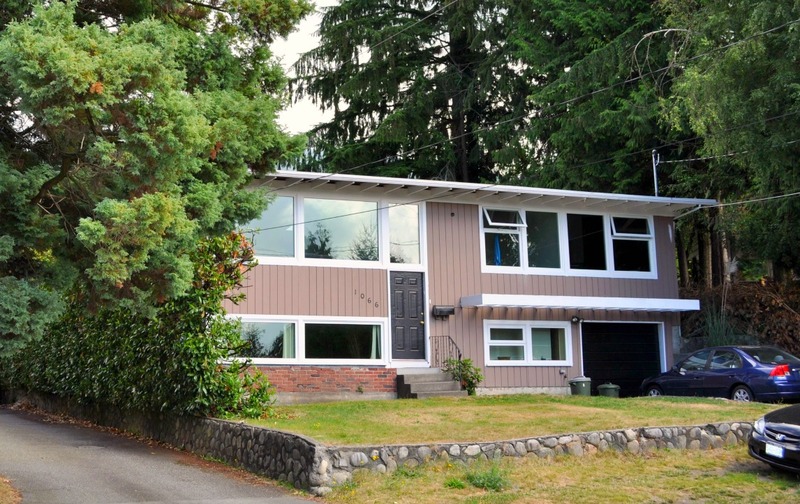 This has changed, with detached homes in a growing number of neighbourhoods crossing the $1,000,000 mark — in Burnaby East, for example, an area that mixes modest and middling properties. Apartment prices are rising sharply in Vancouver and Burnaby after years of slow or no increase. Analysts and news media have identified the main driver as safe-haven investment from foreign sources, especially China — drawn by a liveable Chinese-speaking city, a cheap Canadian dollar, low interest rates and an open real estate market. The British Columbia government has not confirmed this proposition, but it has started to gather data on the citizenship of property buyers, for what that’s worth. The provincial opposition leader has recently suggested that money-laundering is part of the foreign investment equation. The negative effects from home price inflation are diverse. The Vancouver Board of Trade has warned that extreme home prices discourage professional, technical and creative people from moving into the region. Vancouver’s stock of heritage residences is vanishing as buyers tear down existing homes regardless of condition. There’s a perception that affected communities, especially in the City of Vancouver, are becoming severely depopulated as homes are snapped by non-resident buyers (although recent official numbers suggest this perception is exaggerated.) Local governments face pressure to allow the replacement of affordable rental units with condo apartments, as reported in our recent post on Metrotown. It’s always possible that economic catastrophe in Asia or globally will bring a real estate collapse in western Canada. However, no Canadian government is contemplating dramatic action to block foreign investment or seize control of real estate markets. In the 1970s, governments could nationalize oil companies (Petro-Canada) or freeze land use on a broad scale (the B.C. Agricultural Land Commission Act), but this is not the 1970s. We should expect caution from governments, and a continued inflow of investment, as long as the current economic climate continues. Below are a few reasons; there may be others. The benefits from the real estate mania are widespread across the British Columbia economy. The BC Real Estate Association has reported $7.51 billion in residential sales in February alone. On an annualized basis this would account for almost one third of the value of the B.C. economy (see p. 59 of the 2016 B.C.budget.) Property purchases support new construction, renovations, furniture, appliance and home decor sales, as well as the livelihood of thousands of people in the real estate business. If government took action that had the effect of reducing home prices, hundreds of thousands of long-time homeowners in B.C. would lose equity in their homes, as argued vigorously by the Premier as recently as January 2016. B.C. and Canada have no interest in jeopardizing our trading relationship with China. Along with neighbouring Oregon and Washington, B.C. is dependent on export sales to China. These account for up to 20 per cent of the total B.C. exports in any given year, and ours is an export-dependent economy. B.C. and Canada have nurtured close interconnections with China over the past generation. British Columbians are not positioned to criticize others for investing in foreign property and driving up real estate values. The U.S. National Association of Realtors reports that Canadians spent $100 billion to buy U.S. residential properties between 2009 and 2015, putting us second only to the Chinese as foreign investors in the American market. My wife and I have owned an apartment in Arizona since 2011, and the process has been remarkably trouble-free — so far. Regulatory tinkering of any kind is arguably difficult and ineffective; in this case, the draconian regulation that would counter the problem is simply not part of the toolkit of today’s governments. How do governments sort whether homebuyers’ motives are speculative or otherwise, even with a dedicated housing police? On the tax side, two-per-cent adjustments might amount to a few hundred dollars per year. The NDP’s David Eby appeared recently in a Vancouver debate on housing (sponsored by Urbanarium) across from business professor Tom Davidoff; the professor said that many Chinese investors fear the total confiscation of their assets if there’s a shift in China’s political climate. In this context, foreseeable Canadian tax measures are a minor consideration. Davidoff proposed the following available measures to reduce property speculation and address problems related to housing affordability in Greater Vancouver. First, jack up Canadian interest rates to put a price on speculation. (Not going to happen.) Second, aggressively raise property taxes and compensate B.C. residents through reduced income and sales taxes. (Won’t happen.) Third, abolish protective zoning for single-family housing and allow the creation of new densified housing as the market dictates. This last one won’t happen on a significant scale. Local governments in Metro Vancouver have reached a rough consensus that densification will be focused on frequent-transit arterial streets and at the industrial margins. To the extent that we see new apartment construction, it’s logical to imagine that foreign buyers will also speculate in that sector, constraining supply and driving up prices. A comprehensive report on Vancouver real estate from Goodman, a Vancouver consultancy, suggests that Asian investors may already be taking this step. 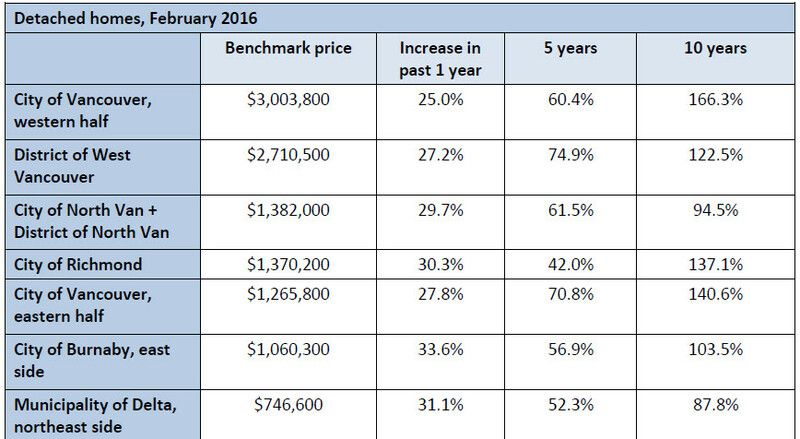 *North Delta numbers in the above charts are from the Fraser Valley Real Estate Board, March 2016; other information is taken from the Greater Vancouver Real Estate Board, March 2016. North Delta is presented as an area where relatively slow detached-home price appreciation has given way to rapid in increases in 2015-2016. My stake in this issue, by the way, is hypothetical. We own a townhome in an outer suburb, and it has not yet felt the effects of the recent acceleration in home price inflation. read 40- to 50-year-old homes – are being sold for close to a million dollars. Where shall we move when we decide to cash in? Hmmm. Maple Ridge, most of the Fraser Valley regional district, the mid and north parts of Vancouver Island are still a lot less expensive than Coquitlam. For now.